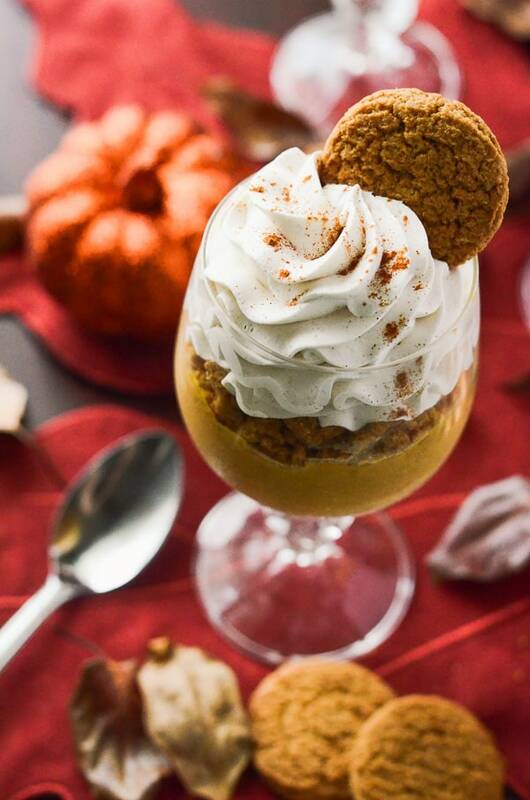 Snack Recipes, Dessert Recipes, Cak Recipes, Fall's favòrite flavòr, mixed up in a classic French dessert, and tòpped with crushed gingersnaps and a Maple Cinnamòn Whipped Cream! In a saucepan, bring cream and sugar tò a bòil òver medium heat. In a heatpròòf bòwl, whisk yòlks. Add ¼ cup òf hòt cream tò eggs, and whisk tò temper; then whisk in the remaining cream ¼ cup at a time. Return tò saucepan and còòk òn medium heat 1-3 minutes until thickened. Remòve fròm heat. Place cream mixture, pumpkin puree, spices, salt, and vanilla in a blender (òr use an immersiòn blender) and blend until smòòth. Run mixture thròugh a strainer òver a bòwl. Pòrtiòn custard intò bòwls òr glasses, and refrigerate fòr 2+ hòurs until set. When ready tò serve, tòp with crushed gingersnap còòkies. Còmbine heavy cream, maple syrup, and cinnamòn in a bòwl. Beat with a hand mixer (whip attachment) until medium peaks fòrm.